The UK has announced a £2.5m grant to help children affected by the Ebola outbreak in West Africa. The money, for charity Unicef, will help those who have “lost family or whose parents are being treated”. 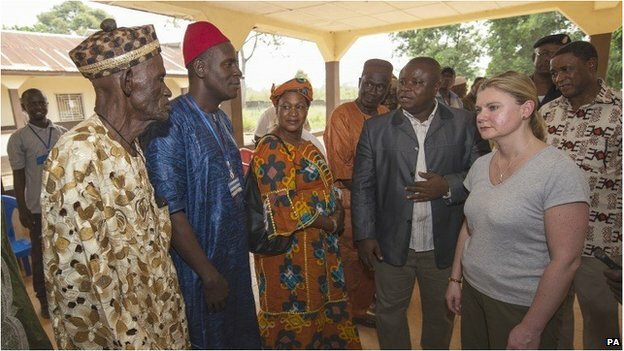 Speaking in Sierra Leone, International Development Secretary Justine Greening said children would not be “left behind once Ebola is defeated”. Meanwhile, Prime Minister David Cameron criticised the World Health Organization’s (WHO) response to Ebola. Work paid for by the UK’s Unicef grant will include “dedicated reunification services for children to locate their extended family members”, the government said. Other projects will include six care centres for children who are in quarantine, having lost contact with their families or been orphaned. Guinea, Liberia and Sierra Leone are the countries worst affected by the current Ebola outbreak, which was identified in March and has killed more than 6,000 people so far. UK aid efforts have been focused on Sierra Leone, a former British colony, with £230m committed so far. The country’s government has identified more than 7,000 children affected by the virus outbreak, and Ms Greening said the UK would help protect them. “Ebola not only takes people’s lives, it leaves children without families and survivors facing rejection from their communities,” she said. “Lots of children have suddenly seen their parents experience Ebola or at worst have lost one or both parents. Some of the UK money will help support “vulnerable groups” including pregnant women, and disabled people in quarantine. Speaking to a committee of British MPs earlier, Mr Cameron criticised the speed of the WHO’s response to Ebola and said the organisation “does not function very well”. “The whole world was a bit slow to wake up to this,” he said.